Plan your day BEFORE you check your email and other simple email lifehacks. Are you struggling with email overload? 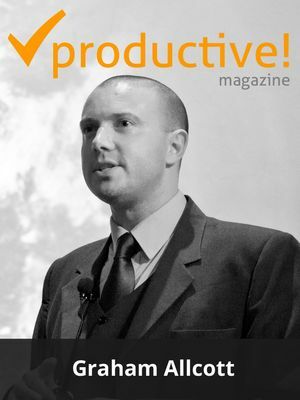 Graham Allcott, the principle at ThinkProductive and the author of How To Be A Productivity Ninja, shares his tips and lifehacks that allowed him to check his email only twice a week. What is a single most effective thing one can do to reduce time spent on emails? Most people don’t really think about email – they just do email. So being mindful of how you use it, and in particular the negative effects of it on your concentration and attention is huge. One simple way to do this is to start your day with planning and a daily ritual BEFORE you look at your inbox. This is really hard these days, as most people have access to their emails as they roll out of bed, but having the discipline to spend time away from email, particularly earlier in the day, makes a big difference. What are some of the typical mistakes people do when (mis)managing emails without even realizing it? People use email to do too many things. It’s a place where new stuff lands, where you keep things you’re still working on, where you keep things you want to read later, where you remember things you’re waiting on other people to do… so it becomes stressful or at the very least tiring for the brain if you’re constantly ‘flitting’ between all these different things. The other big problem with email is interruptions. Having the notifications turned on means you’re interrupting the flow of your work and attention regularly just to look at new emails. I’m always amazed at how few people turn off their notifications, but doing so can make you much more productive. Installing mobile app to check emails – good or bad idea? It depends. Lots of the phone apps and Gmail plugins have really great functionality, but mobile email in itself creates habits that fuel distraction rather than Zen-like calm and clear thinking. So whilst it’s a great time-saver to check email on your way to work, there are other things you can do that are less obvious that will also be as useful in saving you time. Keep a list of the things you need to think more about, or carry your tasks list in your phone and you’ll be able to spend more time thinking actively about your own priorities rather than reading passively about everyone else’s! What do you think about using enterprise social networks, group chats and other collaboration tools to reduce the volume of internal emails? I think the technology is really promising, but isn’t there yet. Collaboration tools only work once they get so easy and intuitive that everyone uses them and I don’t see that just yet, but I think we could get to a point where email in a few years’ time is almost like what a formal paper letter is today: it could become the medium we use to confirm formal decisions, whereas the more low-key chit-chat gets done in more collaborative spaces. Should every organization's email manifesto be different? Do companies even need them? Yes, I think email etiquette is an often-overlooked area. For example, we sell A LOT more “Getting Your Inbox to Zero” workshops than we do “Email Etiquette” ones, because people feel that personal pain around email, but there’s also a lot of pain that comes from the cultural aspects – creating a good set of guidelines for your company is a surefire way to reduce stress and reduce the amount of time email wastes in peoples’ lives. How much time do you spend on emails yourself each day? Well, I did an “extreme productivity experiment” last year wh ere I only checked my email on Fridays! I wasn’t surprised to learn that doing that created a lot more time and attention during the rest of my week for making progress on bigger creative tasks, but of course once a week was a little unsustainable. But as a result of that deliberately extreme experiment, I settled on Tuesday and Thursday evenings as my time to process email back down to zero. So these days, that’s what I stick to: two periods of about an hour each, during a regular week. I use a lot of rules and folders in Outlook so that a lot my email is ‘pre-screened’ and doesn’t land in my inbox, and then I also have an assistant who does a finer sort of things, as well as replying to certain things on my behalf. So I cheat a bit, but I think there are a lot of people for whom email isn’t the job and that feel trapped by it. Maintaining a zero inbox, for example, is something that I struggled with for years but have got really good at now. There’s a whole chapter in my book about that.